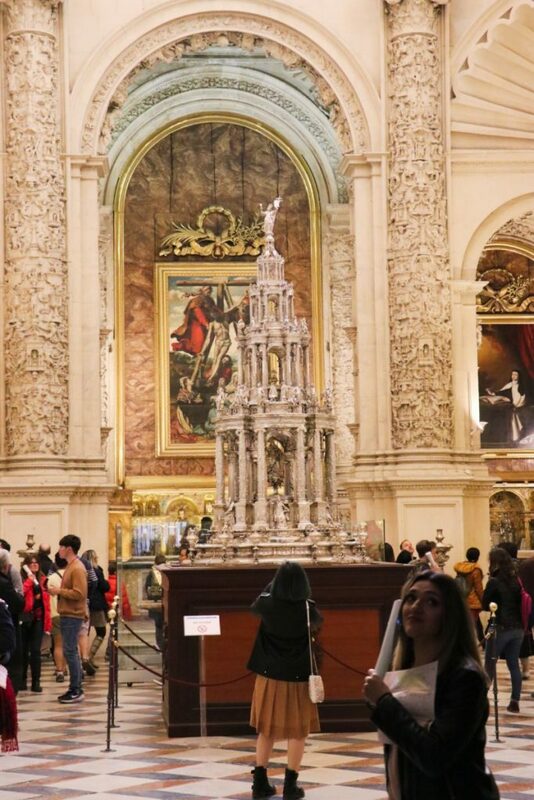 The cheapest tickets for Seville Cathedral are sold online with skip-the-line time-slot reservations. Tours and combinations with the Real Alcazar are also good options. Free admission is possible on Mondays. Seville Cathedral, the largest Gothic church in the world, attracts around two million annual visitors making it among the top five sights to see in Spain. Online skip-the-line time-slot reservation tickets for Seville Cathedral are the cheapest and simplest way to buy tickets to see the church, as ticket queues move very slowly. Guided tours are also a good option with combination tours a good deal to also see the nearby Real Alcazar for which tickets are even harder to obtain at short notice or during busy periods. 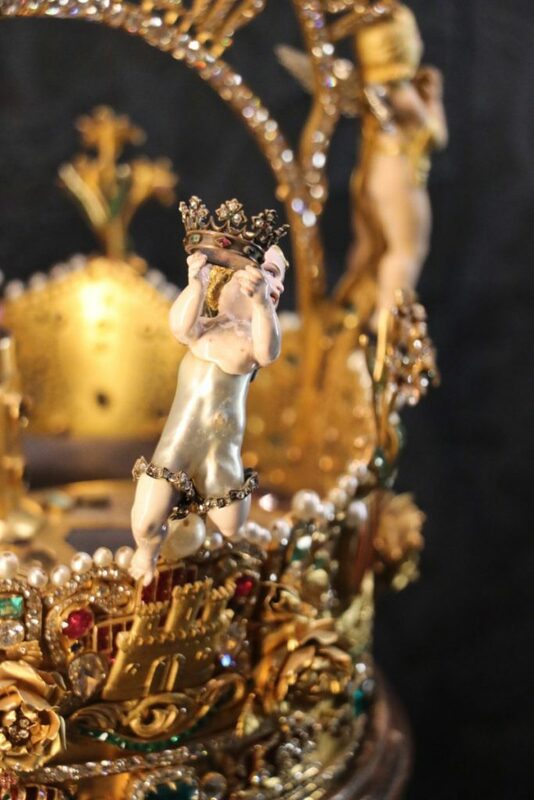 Admission tickets for Seville Cathedral are €9, €4 for students 15 – 25 and seniors over 65, and free for children under 15 (but include them in online purchases). 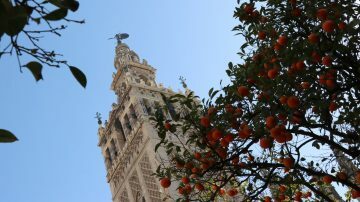 The basic ticket includes admission to every part of the cathedral that is open to regular visitors including the cathedral interior, vestries, chapter house, treasury, the Giralda church tower, and the orange tree courtyard. 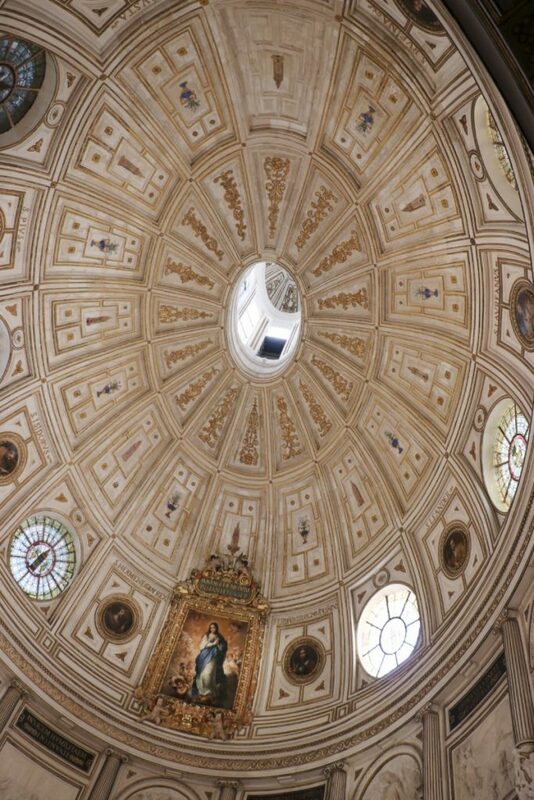 It also includes admission to the Church of the Divine Savour (El Salvador), a large Baroque church full of grand baroque art a few blocks to the north of the cathedral. 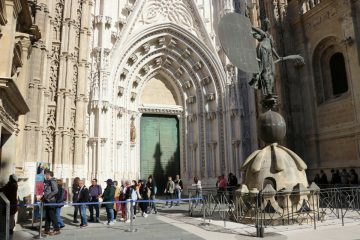 Tickets for Seville Cathedral are available directly at the church but buying here is rarely a good choice, as queues even out of season may be long and slow. Buying online in advance is a much better choice — failing that, walking five minutes north to the large Baroque Church of El Divino Salvador to buy the combination ticket may be faster than standing in line at the cathedral. Note that while this church may be seen separately for €4, it is always included in cathedral tickets. Online purchases currently have a surcharge of €1 per booking irrespective of the number of tickets in the reservation — rarely is €1 better spent. Visitors with tickets (print out or on mobile phone) use the fast track line — currently to the left or via the souvenir shop — and enter the church without delay. Turn up within the given time slot, or for tickets without times, anytime on the ticket date. 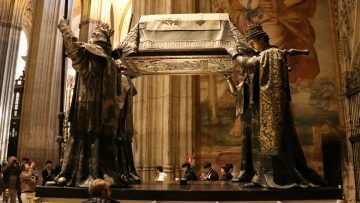 Guided tours are also good skip-the-line options to see Seville Cathedral and especially in combination with the Real Alcazar royal palace complex on the opposite end of the plaza. Guided tours may also be booked longer in advance than the standard tickets, which may be useful to ensure admission when visiting during peak season. The free floorpan pamphlet issued by the cathedral is fairly basic and information inside the church is limited. Buy a good guidebook, an audio guide or guided tour to really appreciate the building and the art. Many tours are offered by a variety of tour guides but two are only available from the cathedral itself and well worth considering: a guided visit to the rooftop or a guided tour of the stained-glassed windows. These book out fast and include regular admission to the cathedral (without a tour) on the same, or following day. 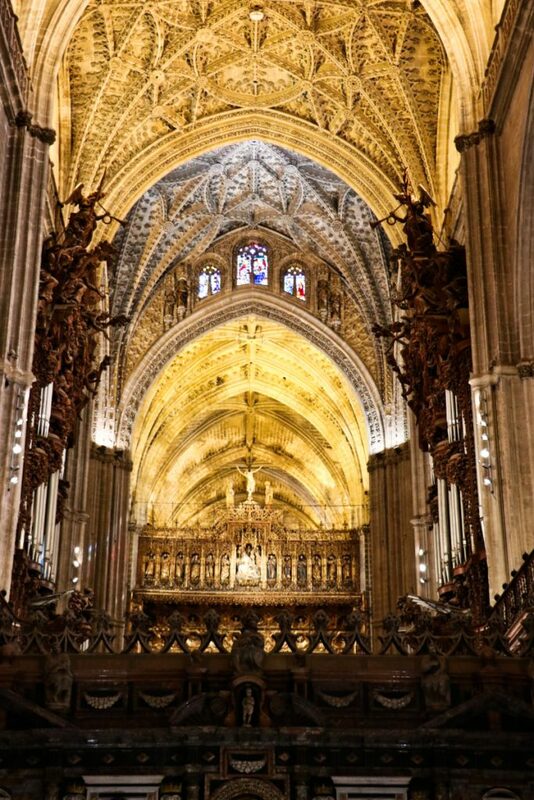 Basic Seville cathedral only tours are usually around 60, 75 or 90 minutes – duration not necessarily an indication of price or value. With all tours it is easy to stay longer in the Cathedral at the end of the tour if desired. Better value is often offered by combining Seville Cathedral with the Real Alcazar royal palace that is often hard to get tickets for. 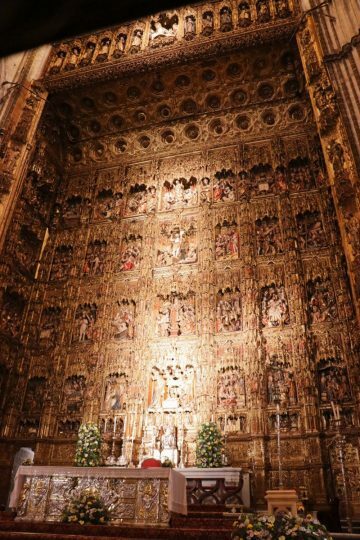 Basic combination tours usually include both the cathedral and Real Alcazar in 2.5 or 3 hours but for some the longer 4-hour tour with early morning admission to the Real Alcazar is a more appealing option. 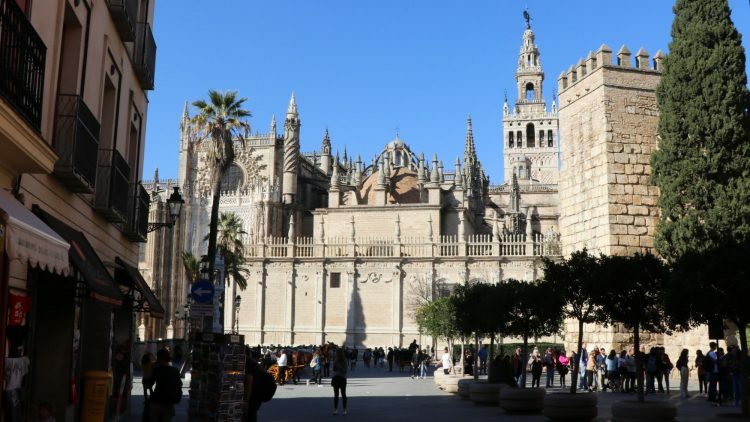 Also interesting are combinations with the hop-on, hop-off buses or tours that offer the option to see the cathedral and Real Alcazar on different days, or with a gap for lunch — this makes it possible to stay on for longer in both sites at the end of the tours. The cathedral is open from 8:00 in the morning for religious services in Spanish. Small parts of the cathedral may be seen for free but most of the huge building will be blocked off and unlit. Early services (8:30) are usually in the Capilla Real (Royal Chapel) in the front of the church. More interesting is the mass at 10:00 in the Capilla Mayor in the chancel. The main organ is often played during this service. These religious services are not for sightseeing — it is not possible to stay in the church after services or even see the unlit areas. Admission for religious services is via the smaller entrances at the front and rear of the church — not through the main entrance or the exit via the orange tree courtyard. 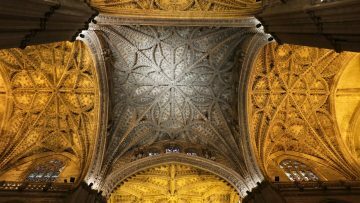 See also Visit Seville Cathedral for more on this amazing building and its art and Booking Roof Tours of Seville Cathedral for more on this special rooftop tour.